We saw in last week’s post about David and Bathsheba that God graciously forgave King David for his terrible sins of adultery and murder. However sin has consequences. First of all, David and Bathsheba’s child died. Secondly, Nathan foretold that there would always be trouble in David’s family. We see the fulfillment of this prophecy starting in the very next chapter of 2 Samuel and it continued until the end of David’s life. Trouble in David’s family started immediately with the story of Tamar and Amnon. (2 Samuel 13) These two children of King David were stepsister and brother. Amnon raped Tamar and left her devastated. Absalom was the eldest son of King David and Tamar’s full brother. He sought vengeance against Amnon for humiliating his sister. Absalom set a trap for Amnon and had him killed. Then fearing the king’s wrath, Absalom fled. Thus began the bloodshed predicted by the prophet Nathan. Three years went by and Joab, the general of David’s army, perceived that King David really loved and missed his son, Absalom. Joab thought of a way of bringing Absalom back home. He enlisted the aid of a “wise woman” from Tekoa. Tekoa, a city now in ruins, was on the Eastern slopes of the Judean hills about twelve miles south of Jerusalem. This would have been about a day’s journey. It was also far enough away so that David could not immediately check up on the woman’s story. The term “wise woman” is used three times in the Old Testament. This woman from Tekoa is described as a “wise woman” as well as the woman from Abel Beth-maacah (2 Samuel 20) and the wise woman from Proverbs 14:1. This phrase seems to describe an older woman who is noted for giving good counsel and thereby may have considerable influence. Joab sent for this woman and instructed her how to dress and what to say. He was basically asking her to pretend. Apparently this woman agreed with Joab’s purpose for the deception. 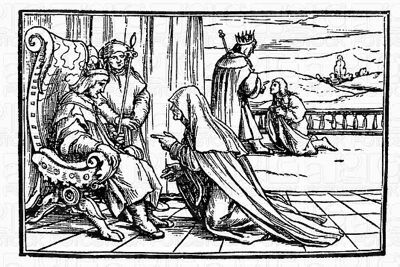 For the sake of the people she was willing to face the king and risk his wrath, especially if he found out she was sent deliberately by Joab. The woman of Tekoa went before David and fell on her face and said, “Help, O king.” David asked her what her trouble was. She proceeded to tell him a story that was purposely made up to be like David’s own story. King David told her to go home and said that he would do something about it. But the wise woman would not be put off until her purpose was accomplished. She wanted the king to grant mercy to his son Absalom. Of course the king did not know at first that that was her only purpose in coming. In a very respectful way she continued pleading with David, carefully leading him to the conclusion that Absalom’s banishment should be ended. The woman was saying that the death of her own son was a small thing in comparison to the death of the king’s son. Absalom was looked upon as David’s successor to the throne. David owed it to the people to make amends with Absalom. The wise woman accomplished her purpose. This woman was not just flattering David, but she was showing her devotion to God and to the king. She clearly understood the issues and she showed wisdom in how she approached the Lord’s anointed leader. Because of her humble attitude and wisdom she won David over. David told Joab to go and bring Absalom back home. What are some lessons to be learned from this story? We might wonder whether or not it is ok to tell “stories” even for a good purpose. The wise woman allowed herself to be used by Joab for a greater purpose. If we understand that there is something bigger going on than just our own concerns, we may be justified in using deception. A good example of this is Corrie ten Boom who lied to the Nazi soldiers about the Jews that she was hiding in her home during World War II. We must be very careful. We have an obligation to pray for discernment so that we don’t harm others or lead them astray. We must pray that what we are doing is in God’s will. Obviously, the wise woman of Tekoa thought that the reconciliation of David and Absalom would please God. It was part of God’s gracious plan. God used this wise woman to accomplish His purpose. We will see in continuing stories that it was part of God’s overall plan of redemption. Perhaps the wise woman could not know it, but modern readers know that God had planned for Solomon to be the next king. This story is part of the continuing saga of the fallout from the strife amongst the children of David that was predicted by the prophet Nathan. Next week we will continue this story. What a tragedy sin is. But more importantly, how good God is Who brings good out of the bad.